The Yankee Chapter had another great meet at Gary S's house in Madbury NH. Thanks to Gary S., Rusty M. and Wayne G. for hosting the event. Mixed on the lawn with the falling leaves were lots of motors and gear! 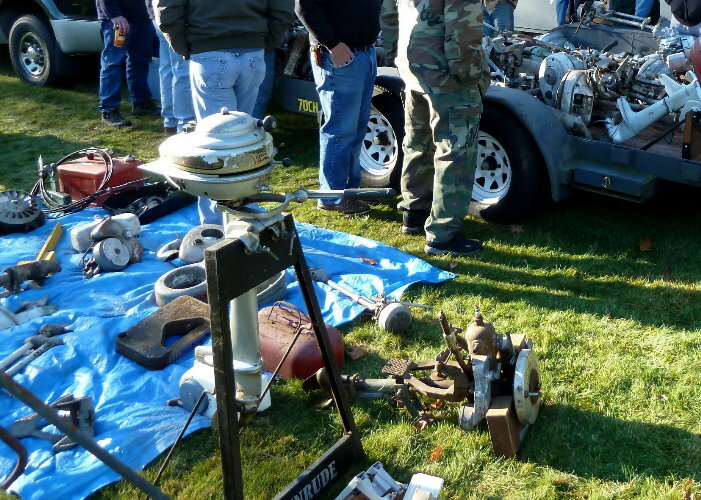 I think about 2 motors were sold/swapped or given away for every person in attendance. Weather started chilly, warmed up mid-morning to be beautiful, then cooled off during lunch. It was great to catch up with everyone. Since it was our final event of the year, a moment of silence was observed in remembrance of Rick Wilson and Carl Renholm who passed away this year. Their passing has been a loss to us all. Here are just a few photos, thanks again to Gary for the meet! That Tanaka looks a little new for us, Champion and Neptune are more our thing. 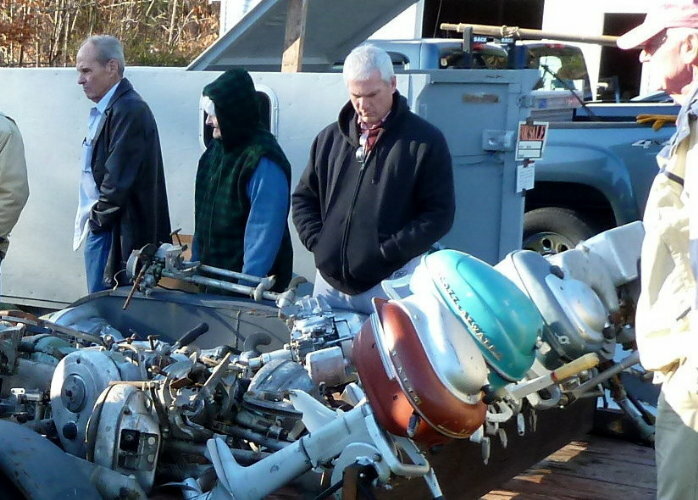 Tom & Dean had Scotts galore, sold them for the Bendix motors seen in the background - even more showed up later! Those boxes had what appeared to be a mostly complete 1930 Elto Speedster that had been totally disassembled - it was free to anyone willing to take it on! It is always difficult to rest an HA-10 down on the ground or in the trunk of your car - that's why all of them have dented and bashed gas tanks. This example has a nifty rest/carry handle - not sure if this was manufactured or put together by a former owner. What a great idea!